Another year of sewing had come and gone! I think I’ve had a pretty good year sewing-wise – some very successful projects! Some are unblogged – so you are going to see some new stuff below. First up, some unselfish sewing. I made quite a few toys for the kids this year – we often make a random bag or pillow or soft animals here and there. I didnt keep track of them much – i suppose I get much more excited about apparel sewing. So here are stuff I’ve made for them. Its really not much comparing to how much I sew for myself, but honestly, A has more than enough cloth, and K is very particular about what she wants. She tells me to not sew stuff for her unless she’s very sure its a style she wants. What she wants and what I want to sew hasnt overlapped too much. I do feel pretty lucky to have such a conscious 7 year old who doesnt want me to waste time making stuff that she might not like. I love how these looks on them, but for little K the head hole was a little small so she doesnt love wearing this. little A is a lot more receptive to my outfit suggestions and wore hers pretty often. (Unblogged) This amazing (if I may say so myself) butterfly top. I love it a lot and little K did too, but maybe its too much – she didn’t want to wear it after the first time she did… So I need to wait for little A to wear this for a insta-dad picture set. (unblogged) A very Swirly dress for little K, she likes it a lot! (Unblogged) Rayon velvet rope for little K.
She had requested the same rayon robe I made for myself last year. I had such a hard time hemming the velvet so I just lined this one with grey jersey so i dont have to hem it. This rayon velvet is stretchy, so it was really hard to make! She loves it though, so all worth it at the end! Not including random toys I made for kids, I made two bags this year and they are both big, long, but enjoyable projects! All kept and used frequently. Mr Elephant Bag – perfect As a “basic” black little bag! It worked especially well after I got a smaller phone. Quilted Tool bag: it has been and will be heavily used. I put my knitting project in there so its perfect! Of course, mostly i like clothing for me! Lets start with my least successful one! Knitted sweater – not worn even once! But I did learn how to purl properly with this one. I cannot unsee the mistake and its too warm. I might frog this for making a sweater jacket or something. July 4th dress. It looks pretty great on the photos but its just… not me. I tried altering it and ended it being too short. It is wasting away in my scrape fabric pin. Grey Dress, i like this one but for some reason just dont wear it often. I think it will work better on my body if I opened up the bottom of the skirt. (Unblogged) Olive skirt – super simple rectangle skirt, i made it slightly larger so I passed it to my mom. But its pretty nice! (Unblogged) Rayon pants – very basic, and comfy. I wore it a few times but should wear it more! (Unblogged) two tops from the same fabric – mostly to test out the cover stitch I bought and while I am not all that excited about them, I wear them since they fill a wardrobe gap. Striped top + black linen skirt – I wore this combo to work so often! 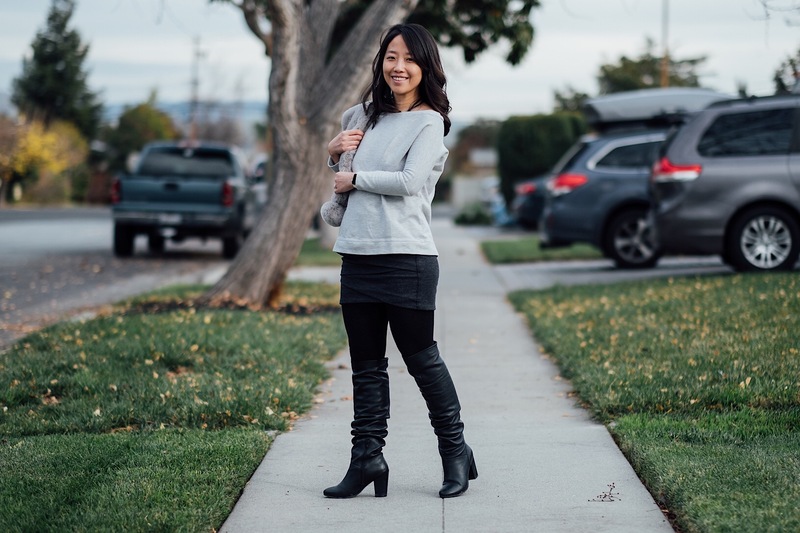 Grey sweat shirt + Jade skirt combo – I wore this combo a lot! Though these two are more versatile with other stuff in my closet! (Unblogged) I actually love this make but haven’t had the chance to blog this. I made this trench inspired skirt and love the color. The black button makes this one combo well with black. (Unblogged) I made this apron dress and need to make a tutorial for this! Hence Unblogged. Okay, now it comes to my favorate type of things to make – jacket/coats!!! This one is striped moto jacket, its a little crazy so I cant wear it to many places. However, I still love it! I love this pink coat design, but the interface sucked and its a little wonky now. I still wear it but am now stocked up on better quality interface! It’s worth every penny. And lastly, my favorate make of all year, this crazy convertible trench coat! I noticed that I am out of the “lets make the basic camel and black coat” phase – all of the coats I made this year has some colors! Total made:kept:worn_often ratio is 36:34:30 – probably one of the worse ones in recent years. But I’ve also made some very cool stuff so I am quite happy. I am surprised by how many things I made this year! I’ve had an very busy year with work, and picked up night swimming later in the year. I wonder how I managed to make more than last year! Maybe the average difficulty of most of the things I’ve made is less? Or maybe because the kids are playing more together on the weekend and I often have 10-20 minutes of “sneaking into the sewing room” time. Anyways, what a productive year! In the new year I aim to read more instructions and learn better techniques for sewing! Thank you all for reading my sewing ramble for another year!! This entry was posted on Sunday, January 20th, 2019 at 8:16 pm	and posted in Uncategorized. You can follow any responses to this entry through the RSS 2.0 feed. you are so right, what a productive year! especially as I know how much time things like coats and jackets take. and I love what you said about the striped moto jacket “a little crazy and I can’t wear it to many places” I feel the same way often – making crazy colorful clothes and you go somewhere and everyone is wearing black and beige. Oh well too bad for them, right!!! colorful clothes are more fun 🙂 I’m always happy to see a new post from you, your ideas are so clever and love the photography too. Happy New Year. Oh so true! I think especially more so in California. I have been asked a ton on “what are you dressed up for” a few years ago, but now everyone seems to be used to me being dressy and no longer question it 😉 rock your colors! Your coats/jackets are too beautiful to spend time in a closet! Holy. Crap. That is a lot of article of clothing! I don’t know how you pull it off being a full-time Mom and working as well. Super impressed. Keep it up! Hehehehehehe, i think the secret is to have my mom and dex help me on a lot of child rearing and home duties! Your sewing output is so impressive to me, especially since you often mix in more challenging dresses and jackets/coats—I think I’d be hard pressed to sew 36 things in a year even if they were all t-shirts and leggings! Out of all your projects, the butterfly shirt might be my favorite. If I had one in grown-up size, I could live out all of my childhood dreams of enchanted forests. The trench coat and trench skirt are the (more practical for daily life) runners-up for sure. I’ve bookmarked your post on the quilted knitting bag for future reference. Cheers to 2019! Aww thank you so much for reading!! I actually find the “simpler” knit fabric project more challenging. It is so tough to get it right! I am so glad you like the butterfly one. it was pretty easy to make actually – though if you like your wings stiffer (and may need it since its bigger) i realize you can use the stiffer interface in the quilted knitting bag’s required interface list!